Jamun (also called Jambul, Java Plum in English and botanically accepted as Syzygium Cumini) is native to India and indigenous part of Indian folk remedies. In Ayurveda, its fruits, seeds, bark, and leaves are used as medicine for treating bleeding disorders and other diseases. Nowadays, its seeds become famous as anti-diabetic medicine. Jamun fruit has astringent flavor, sweet and slightly sour taste. The fruits are used to prepare Jamun Vinegar, which is beneficial in abdominal diseases such as loss of appetite, abdominal pain, dysentery and irritable bowel syndrome. Sometimes, it is also used for indigestion. Jamun seed powder (Churna) is used in the management of diarrhea, dysentery, and diabetes. Jamun leaves are prescribed for nausea, vomiting, bleeding disorders, and metrorrhagia. Jamun (botanically known as Syzygium Cumini) is known for its seasonal perishable Jamun berry, which is also named as Java Plum (in English) and Jambul. It belongs to the Myrtles family Myrtaceae. Jamun tree is evergreen plant grows up to 30 meters in height and has a girth of around 3.6 meters. The Jamun tree grows in tropical and sub-tropical parts of the India and found in Indian Subcontinent. Jamun tree is widely distributed forest tree found in India, Sri Lanka, Malaysia, Bangladesh, and Australia. Jamun fruit is oval in shape. In immature stage, Jamun fruit is green in color. Its color changes to crimson black with ripening. The seed in the fruit bears about 25% of its weight and fruit pulp and peel have 75% of its total weight. Ripe Jamun fruits are odorless and juicy. Jamun plant was first cultivated in Indian sub-continent and it is grown in many other regions of south Asia such as India, Bangladesh, Nepal, Pakistan, Burma, Indonesia, and Sri Lanka. In southern Asia, Jamun tree is worshiped by Buddhists and it commonly grown near Hindu temples because it is considered sacred to Lord Krishna. All parts of Jamun Tree are used in medicines. These phytochemicals provide various therapeutic benefits and thus, Jamun is renowned for its medicinal values. Phytochemicals in Jamun seeds are used in various disease curing applications. In general, all parts of Jamun tree (Syzygium Cumini) have astringent, anti-diarrheal, anti-microbial and anti-inflammatory properties. Prevention Kali Mirch (black pepper) and Kala Namak or Sendha Namak should be added in juice to prevent its side effect. Interactions Milk & Tea should not be taken before and after eating Jamun. Jamun fruit pulp, seed with seed coat and kernel, alone kernel, bark and leaves all parts are used in many health conditions. We discuss its benefits and medicinal uses according to different parts of the Jamun Plant. Here are some common benefits. Sodium and potassium are two important electrolytes that are required for regulating blood pressure whereas, magnesium and calcium are vital for strong bones and teeth. Besides this, Jamun pulp and seeds also contain other minerals such as zinc, phosphorus, iron, copper, manganese, chromium and chlorine. It also contains a variety of vitamins such as vitamin A, thiamine (vitamin B1), riboflavin (vitamin B2), niacin (vitamin B3), folic acid (vitamin B9) and vitamin C.
Jamun pulp also contains sugars such as galactose, fructose, glucose, maltose and mannose. Of all these sugars, maltose is present in the highest quantity. These antioxidants along with other health promoting compounds scavenge free radicals and combat oxidative stress. Extracts of Jamun seeds have antioxidant potential and it works by trapping free radicals such as superoxide, hydroxyl, and lipid peroxide. β-carotene, a potent antioxidant present in Jamun inhibits auto-oxidation and thus protects the body against various harmful diseases. Research has shown that oral administration of Jamun seed extract lowered oxidative stress and increased the level of antioxidant in the body. Hypertensive and individuals with altered lipid profile are at an increased risk of developing heart diseases. Research has shown that Jamun fruit and its other plant parts are very effective in reducing the risk of such diseases and thus provides protection to the heart. Individuals with heart diseases are often in the state of oxidative stress. Reduction in oxidative stress further reduces the risk of heart diseases. Jamun possesses antioxidant activity which in turn combats oxidative stress. Besides this, Jamun extracts also protect the cardiac cells against the harmful effect of free radicals. Jamun Fruit Pulp is juicy and has amazing sweet and astringent taste. It imparts crimson black color on the tongue. It is nutritious and rich in phytochemicals and antioxidant, which helps to maintain the health. According to Ayurveda, if Jamun fruit pulp or Jamun juice is taken before food, then it increases VATA DOSHA in the body. To prevent it, it should be taken in PITTA KALA (Time when Pitta is predominant in body and nature). The best time to eat Jamun is afternoon from 12:00 PM to 3:00 PM. Jamun fruit juice is beneficial for improving appetite. It is used in following way for this. Trikatu Churna should be added in 4 teaspoons (20 ml) Jamun fruit juice for improving its digestive stimulant action and preventing abdominal distension. Jamun fruits are beneficial for reducing abdominal fullness, abdominal discomfort, and burning sensation in the abdomen. For this, a handful fruits can be eaten and Sonth (dried ginger root powder) should also be taken with water after consuming the Jamun fruit for maximum benefits. Jamun fruits reduce the inflammation of the colon linings and astringent action reduces the frequency of bloody stools. It is effective when a patient passes stool with a feeling of burning pain and mucus content may also be present in the stools. The astringent action of Jamun fruit reduces bleeding in the stools and reduces the frequency of loose stools. In Ayurveda, it is advised to drink its juice in a dosage of 20 ml along with Gulkand (2 teaspoons). Research has shown that Jamun has anti-tumor activity in which it inhibits the growth of the tumor. Research has also found that treatment with Jamun reduced the incidence of the tumor as well as reduced the size of the tumor. This effect is possible due to the ability of Jamun to detoxify harmful cancer-causing cells. It also plays a protective role by inhibiting the action of free radicals and by combating oxidative stress. Excessive exposure to toxins, infectious agents, and drugs to the liver causes damage and injury to the liver. It leads to the generation of free radicals that impair the normal function and structure of the liver. During this period, levels of liver enzymes increase and blood sugar levels also rise as glycogen is stored in the liver. It was found that treatment with Jamun extract reduced the level of liver enzymes as well as blood sugar levels. Furthermore, it restored the normal function and structure of the liver. This result indicates the Jamun extract possesses liver protective (hepatoprotective) activities. Research has also shown that toxic agents react with liver cells and thus, lead to hardening of the liver. Such change in the structure alters the normal functioning of the liver. It has been observed that Jamun acts as a liver tonic and thus, protects it against damage. Jamun also contains antioxidants that scavenge the free radicals, which are formed in the liver during liver damage and thus, it combats oxidative stress. It was even found that low dosage of Jamun extract does not possess liver protective effect. Therefore, more human trials are required to confirm the dosage of Jamun extract for humans with liver diseases and its safety profile also needs to be determined. Jamun Seeds are beneficial in diabetes mellitus and some other diseases, as discussed below. Jamun seeds are widely used for the treatment of type-2 diabetes mellitus in India and many other countries. Jamun bark, seeds, and leaves are utilized for the management of blood sugar levels. Jamun seeds reduce postprandial sugar level as well. A rat study found that treatment with Jamun extract for 15 days significantly lowered high blood sugar levels. An active compound named ‘MYCAMINOSE’ present in Jamun works similar to an anti-diabetic drug called GLIBENCLAMIDE and it stimulates the secretion of insulin from pancreatic beta-cells. Furthermore, Jamun seeds lower blood sugar levels by potentiation of insulin effect by either increasing the secretion of insulin or by increasing its release from the bound form. Thus, the hypoglycemic properties of Jamun seeds may be due to its insulin stimulatory effects. Another interesting research showed that Jamun seed extract inhibits the enzyme that converts carbohydrates into glucose on digestion. Such inhibition prevents a sudden rise in the blood sugar levels after a meal. Fiber present in Jamun seeds such as cellulose, hemicellulose and lignin had a little impact on blood sugar. Some studies have found that high antioxidant content of Jamun combats oxidative stress and thus reduces hyperglycemia. In addition to this, Jamun also increased the storage of glycogen in liver and muscles and thus reduced the amount of glucose in the blood. Jamun also increases the activity of glucose transporter and thus, helps to transport glucose in the liver and muscles. In diabetes mellitus, Jamun seeds are used in dosage of 1 to 2 grams thrice daily. For increasing its anti-diabetic and anti-hyperglycemic effects, the following combination is very helpful. This mixture improves insulin sensitivity as well as boosts the insulin secretion. In initial stages, this Jamun seed combination works awesome without any other medicines. If the patient is taking allopathic medicines, then the need to monitor blood sugar level and reduce the dosage of allopathic medicines gradually as per achievement of good control on blood glucose level. Jamun seed powder is an excellent solution for Glycosuria (sugar in urine). In this case, the similar combination can be used as described above under heading Diabetes Mellitus. Many studies have shown that Jamun extracts have excellent antilipemic activity and it helps to lower high blood cholesterol levels. Treatment with Jamun seed extract helped to reduce high levels of total cholesterol, LDL (low-density lipoprotein) cholesterol, VLDL (very low-density lipoprotein) cholesterol (unhealthy) and triglyceride levels. Such effect of Jamun seed extract is due to the presence of health-promoting compounds such as alkaloids, flavonoids, saponins, tannins, phenols, gallic acid and ellagic acid. Furthermore, Jamun also significantly increased the level of healthy cholesterol- HDL (high-density lipoprotein). Another study observed that Jamun seed extract contains water soluble fiber that significantly reduced the level of cholesterol in the liver as well as in the heart. It also increased the excretion of bile acids, thus more cholesterol is used for the formation of bile rather than being stored in the body. Such activity was due to its gelling property of fiber that gets bound to bile acid and increases its excretion in the feces. Dosage: 1 teaspoon with warm water twice daily for a week or until complete relief from chronic diarrhea. Jamun seed kernels along with Lotus Seed Kernels are beneficial for reducing the heavy bleeding in women. The combination of these seeds is prepared and used in the following way. Dosage: 1 teaspoon with lukewarm milk 3 times a day until complete relief. If the patient has excessive bleeding during menstruation, then this combination should be taken for at least 3 months. Jamun seed kernels are used for acne vulgaris. The seed paste is prepared with warm water and applied on the acnes for 30 minutes and repeated two times a day for several days until complete relief. It is also beneficial for pimples and boils occurring in the summer season. In a similar way, Jamun kernel powder can be applied on foot ulcers for speeding up the recovery and healing. It can also be effective if foot ulcers are due to diabetic complication. Jamun kernel powder is mixed in water to make its thick paste. The paste is applied for 30 to 60 minutes on the feet to treat burning feet syndrome. The application should be repeated twice daily for at least 1 to 2 months. Along with this, Praval Pishti, Gandhak Rasayana, and Amalaki Rasayana should also be taken orally. Jamun kernel powder is also beneficial for nocturnal emission. It stops discharge and used in following way. Dosage: 1 teaspoon with lukewarm water 2 times a day until complete relief. Jamun Seed Kernel Powder in a dosage of 10 grams with milk is given in Nux Vomica Toxicity. It helps to reduce restlessness, dizziness, abnormal spasms, etc. occurring due to Nux Vomica toxicity. Jamun leaves are useful in mouth ulcer, bleeding piles, diarrhea, typhoid fever, etc. Diseases caused by microbes and bacteria have increased tremendously. Therefore, natural agents are required to get rid of these microbes and to protect the body against infectious diseases. One interesting research observed the effect of Jamun leaves against drug resistant gram positive and gram negative bacteria. This positive effect is attributed to the presence of flavonoids, glycosides, steroids, alkaloids, saponins, phenols and tannins. These phytochemicals present in Jamun leaves confer antimicrobial effects. Flavonoids present in Jamun have a natural ability to modify the body’s reaction to the virus and allergies and thus they possess anti-microbial and anti-allergic properties. Steroids and tannins also possess strong anti-microbial activities. Researchers have also claimed that tannins have the ability to inhibit HIV replication selectively. Therefore, the remarkable activity of Jamun leaves may be due to high concentration of phytochemicals and other health promoting compounds present in it. Anti-hypertensive treatment is required to lower the level of high blood pressure and to reduce the risk of hypertension-related complications such as heart diseases and stroke. Studies have shown that a reduction of 5 mm Hg in systolic blood pressure reduces the risk of death associated with heart disease by 7%. Treatment with Jamun leaf extract reduces vasoconstrictor agents that constrict the blood vessels and in turn raise the blood pressure. Furthermore, the presence of flavonoids and triterpene possess significant vasodilatory effect that widens the blood vessels and ensures smooth blood flow throughout the body. In addition to this, antioxidants present in Jamun reduce the oxidative stress in kidneys and blood vessels and thus help in lowering high blood pressure. Besides this, Jamun is a good source of potassium that further helps in the treatment of hypertension. Thus, Jamun can be successfully made a part of DASH diet (DIETARY APPROACHES AGAINST HYPERTENSION). The decoction is prepared using 10 grams Jamun Leaf powder and 800 ml water, which is simmered to reduce to 200 ml liquid. This decoction is used for gargling to treat mouth ulcers. Alternatively, a paste is made using water, Jamun Leaf powder and Katha (Catechu). This paste is applied on the mouth ulcers for quick relief. If nausea, vomiting, and loss of appetite are main concerns in opium toxicity than constipation, then Jamun Leaf Juice or Decoction helps to reduce these symptoms. Jamun Bark is helpful for the treatment of urticaria, vomiting, dental problems, diabetes, polyuria and frequent urination. Jamun Tree Bark has anti-inflammatory and antibacterial characteristics, which are useful in the management of pyorrhea. For this purpose, its decoction is used for gargling. The coarse powder of Jamun bark in the quantity of 10 grams is added to 800 ml water. The mixture is simmered to 1/4th i.e. 200 ml. The warm Jamun bark decoction is used for gargling. Gargle with Jamun bark decoction should be done 3 times a day for maximum benefits. It also strengthens tooth enamel and prevents its erosion. Jamun Tree Bark Decoction is also beneficial for the abnormal discharges (leucorrhea). The anti-inflammatory, astringent and antimicrobial effects reduce the inflammation, discharge, foul smell, and infection. The decoction should be prepared as described above under Pyorrhea heading. Jamun bark ash is used for nausea and vomiting. Take Jamun Bark and cuts it into smaller pieces. Burn the bark and obtain its ash. Jamun bark ash should be taken in dosage of 1 to 2 grams with 1 teaspoon of honey thrice daily to treat nausea and vomiting. Jamun bark ash is effective when one has a sour taste in mouth and vomitus is also sour and acidic. It may not be helpful in other cases. The decoction of Jamun Bark along with Mango Tree Bark is beneficial in the management of diarrhea occurring during pregnancy. Take 10 grams of coarse powder of Jamun bark and 10 grams of coarse powder of Mango Bark. Add bark powders to 400 ml water and boil and simmer the mixture to obtain 1/4the. 100 ml decoction. Jamun & Mango Bark Decoction should be taken twice daily. Along with this, Jeera (Cumin) powder and Dhania (coriander) seed powder should also be taken in dosage of 1 teaspoon of the mixture of both herbs. Jamun bark powder along with Lodhra Churna is used in polyuria and frequent urination. This combination can be used along with Chandraprabha Vati for best results. People in India enjoy Jamun with salt. In China, Jamun is eaten as a snack. Jamun powder is manufactured by a few companies in India and it is claimed that this powder fights against various ailments. Many companies have brought up Jamun juice in combination with other juices to serve its health benefits. Jamun jam is a great way to get your daily dose of health-promoting compounds. Jamun wine is a great beverage that is produced commonly in Goa. Other Jamun processed products include Jamun vinegar and Jamun chips. Jamun Vinegar: Jamun vinegar is prepared from unripe and ripe Jamun fruit pulp or juice. It also has tremendous health benefits and useful in gas, abdominal distension, bloating, diarrhea and diabetes mellitus. For more details, read an article on Jamun Vinegar here. Jamun fruits are likely safe and well-tolerated in most individuals. There are no serious side effects reported with Jamun fruits, seeds, leaves, and bark. Gut problems: Jamun plays a very important role in the treatment of various diseases and disorders, but some studies have reported side-effects with its high doses. The complaints were reported such as constipation, nausea, and epigastric pain. Some individuals even reported a change in the color of the urine (red coloration). Jamun fruits are likely safe during pregnancy. Other parts of Jamun tree should be used only if required and indicated under professional supervision. Jamun can also be safely taken by lactating mothers. A rat study was conducted where rats were administered high doses of Jamun extract up to 5 grams per kilogram of body weight. No toxicity or death was observed with such high doses too. Selected organs such as liver, pancreas, kidneys, lungs and heart were examined and no toxic effects were found. Therefore, it can be said that Jamun extract is safe to use. However, human trials are required to understand the toxic effect of Jamun in human if any. Anti-diabetic drugs: The only interaction of Jamun found till date is with anti-diabetic drugs. Jamun extract has a very high ability to lower blood sugar levels. Taking it along with anti-diabetic drugs or maintaining a short time gap between the two may lower the blood sugar level beyond the normal range and so may lead to hypoglycemia. Therefore, before starting with Jamun extract always ask your doctor or health-care advisor. 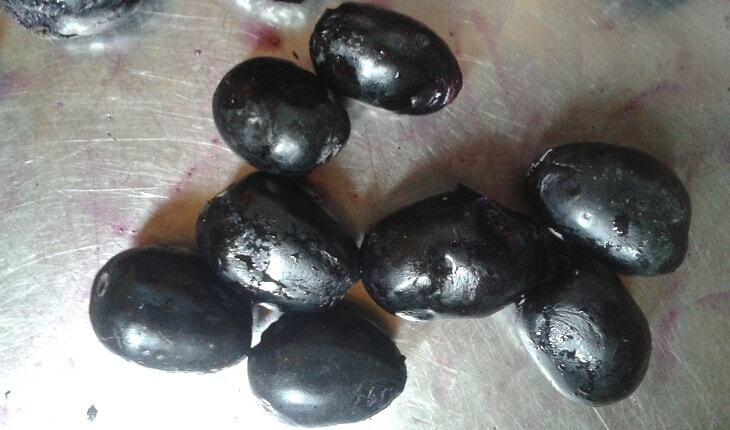 What is effect of Jamun eating on kidneys of diabetic patients? Eating Jamun fruits helps to dissolve kidney stones. It is also likely to improve kidney functions. Can Jamun seed powder increase or decrease the blood pressure? Thank you.